Every morning I make lunch for Leo and Balthasar to take to school. When this began I thought I would use the opportunity to be terribly creative; in fact it has become the least inspired aspect of my cooking life. One day I make sandwiches, one day pasta. I alternate. I know the boys will eat this. The problem with school lunches is that I am not there, at the end of the table, frowning, admonishing, and — yes — forcing them to finish their grilled mackerel and ratatouille. 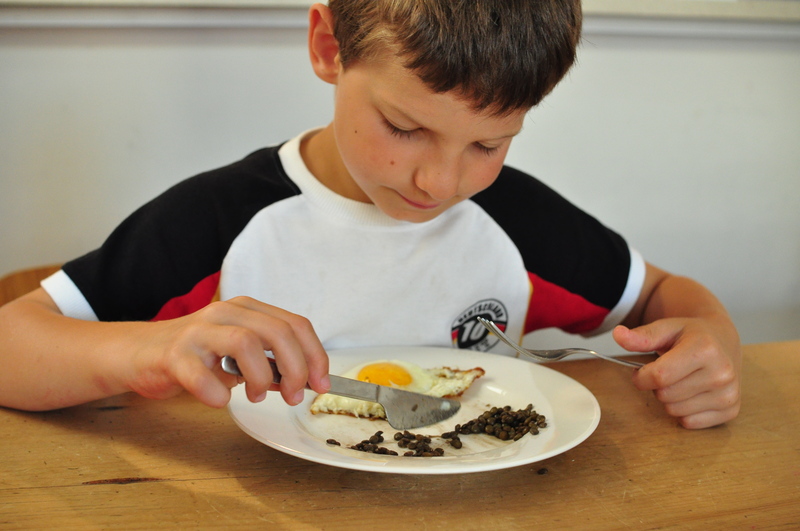 The children eat many things, and, if I may, I don’t think it’s because ‘we’ve been lucky’ but because I’ve made it an excruciating. daily. struggle. But not at school. At first I was just happy that they finished their meal; now I’ve become stuck in this pasta/sandwich routine. I am mindful of what goes into the lunchbox, of course, my mother‘s ever knowledgeable advice always chiming in my ears. But I leave the really good food, the fun food, and the mealtime fights for the evenings. It seems to have payed off. Leo and Balthasar can be coaxed into eating practically anything; Louise, who is 2, is still in a tug of war. Some things need a bit more prodding, and, unhelpfully, it happens that onetime hits suddenly misfire. But there is some predictability. Naturally oftentimes I have little more patience than to throw some frozen peas into boiling water, serve that with a sunnyside egg, and call it dinner; but I know that practically anything that is diligently prepared, well seasoned, and cooked to the standards of something I would serve guests will be polished off. Gratin for example. Actually, I don’t think I’ve ever made gratin for guests. But nonetheless, gratin is a great example. It started out with cauliflower. Winter is not the most propitious season to get children excited about vegetables, and at some point I had to find new ways to prepare cauliflower. I personally like cauliflower best raw, but one day I decided it was time to tackle gratin. I say ‘tackle’ because I was intimidated by béchamel sauce. Many years ago on a skiing holiday I volunteered to make béchamel sauce. It was for lasagna, I think. I knew the basic ingredients and felt confident that, by virtue of being French, I was the person best qualified for the job. All I managed to do was create a giant, ever expanding monster of butter, flour, and milk, which probably wasn’t even any good. As it happened, I had to suffer some lessons in béchamel making from Thomas, who made copious fun of me. This was a very long time ago. I’ve since gained some confidence in the kitchen, so a while ago I decided to tackle béchamel again to make cauliflower gratin, which, come to think of it, is now probably my favorite way of eating cauliflower. The punchline, of course, is that children love gratin. They also love anything that’s been simmered or stewed with onions, garlic, herbs, spices. They love ratatouille (they do! ), they also love risotto (but weeknight dinners rarely enjoy the leisure of 45 minutes of undivided attention). So when I made this squash and zucchini gratin the other day, despite slight initial dismay that it wasn’t cauliflower, the children ate heartily, and asked for more. Gratin is easy to make once the béchamel demon has been tamed. 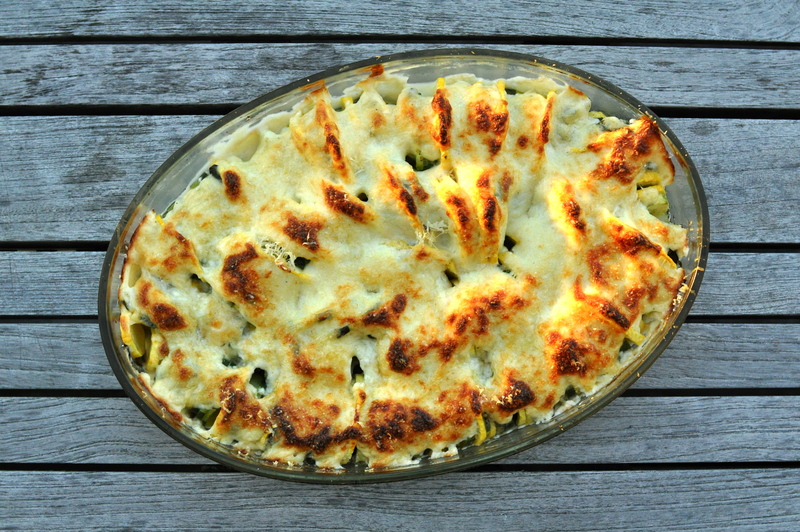 Ideally I’d make simple broiled or pan fried fish with this gratin, since fish and zucchini go so well together. On this particular day I was unprepared and just had some leftover rice, fried to crispiness in olive oil. That was good too. Quantities are for a 9 x 13 inches (23 x 33 cm) oval dish. Wash and thinly slice the zucchini crosswise (into disks) approximately 1/4 inch (1/2 cm) thick. Wash the basil leaves. Place the zucchini slices upright in the dish. Intersperse a basil leaf every 4 or 5 slices. Sprinkle with salt and pepper and pour a very thin drizzle of olive oil over the zucchini. 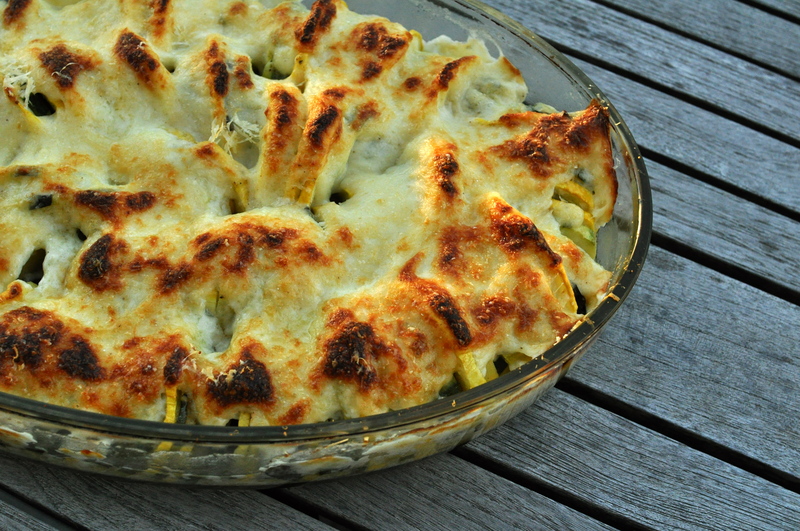 Pour the béchamel sauce evenly over the zucchini and grate lots of parmesan on top. I take no credit for this meal, which is Thomas’s creation. 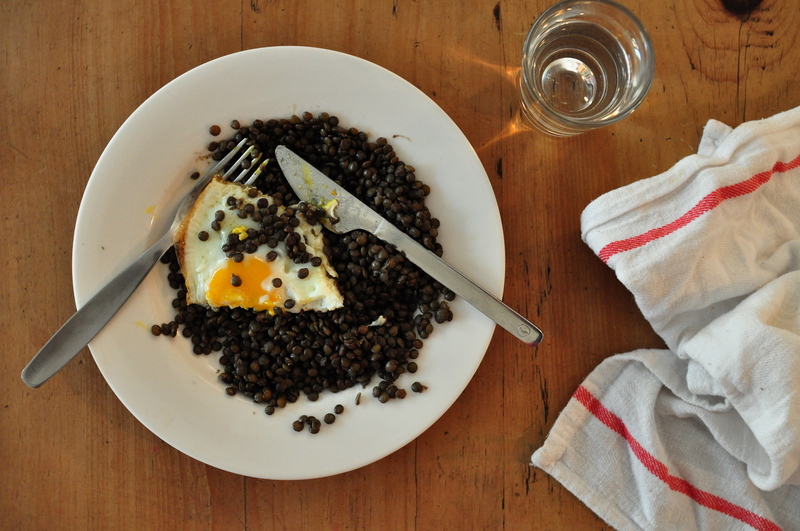 He makes lentils with a fried egg and calls it “cowboy food,” because apparently cowboys ate beans and eggs; so naturally, lentils and eggs… In any case it’s a great meal, a brilliant name, and I have fallen for it, too. I had mentioned cowboy food before in connection with a two-step lentil recipe. This is the quick version of lentils – the whole meal takes only about 35 minutes to prepare, and most of that is the lentils simmering away by themselves. Two cups make a lot of lentils, but it’s always great to have lentil leftovers. They can easily be reheated, or made into a salad. 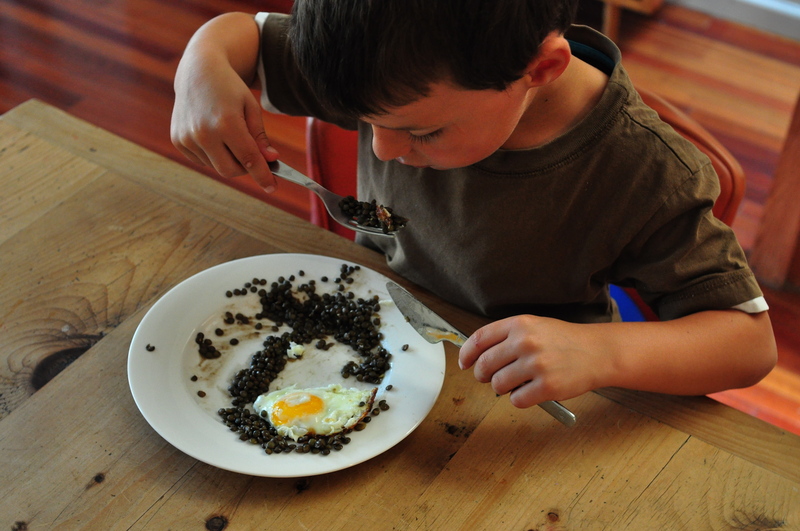 Pick through the lentils to look for small stone intruders that must be discarded. To wash the lentils, cover with cold water and drain in a fine mesh sieve. Peel and cut into large chunks the onion and the vegetables. Place lentils into a large saucepan with 4 cups (double the volume) water. Add the vegetable chunks, the parsley, and the bay leaves, bring to a boil and let simmer, covered, for about 25 minutes. Remove from heat when the lentils are done to your liking – I like them al dente, with a bit of bite. Discard the sprigs of parsley, bay leaves, and vegetable chunks. Season the lentils with salt, pepper, good olive oil and a squeeze of lemon juice. Taste and adjust.